Mr Michael Danby, former editor of what used to be called the Australia-Israel Review and now Federal Labor Member for Melbourne Ports, has a go at two popular Australian websites - Crikey and NewMatilda. He engages in a grievance mass debate in the House of Representatives on 7 September 2009, the contents of which can be read here. ... unmoderated, unleashed and unhinged comments on their websites ... the broad slabs of hate speak published in the comments section following each article ... Newmatilda publishes blatantly bigoted commentary, even though the magazine explicitly reserves the right to moderate that commentary if it is abusive or promotes hate. Only since being exposed has Newmatilda stopped publishing race hate in its comment columns. ... Crikey and its editor, Jonathan Green, have made no explanation or issued no apology. 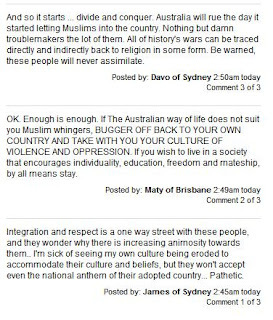 Eric Beecher, the owner of Crikey, who hails from a similar ethnic cultural background to me, owes an explanation for Crikey’s publication of these hate filled comments. Such comments would be suited for publication in Julius Streicher’s Der Sturmer. I write for both websites on a fairly regular basis. Much of my writing for Crikey has been to expose racist commentary moderated in blogs published by far better resourced international news outlets. I have also exposed racist commentary made by bloggers and columnists, some of whom Mr Danby has accompanied on trips to Israel. If Mr Danby is serious about racism on websites, he should consider making an issue of what is published in the Herald Sun and Daily Telegraph. He should consider some of the anti-Lebanese, anti-African, anti-Muslim and anti-Aboriginal commentary published on the blogs of Tim Blair, Andrew Bolt and Piers Akerman. Perhaps Mr Danby could provide some examples of comments left on NewMatilda and/or Crikey comparable to the ones found here or here or here. Or how about these? All this begs one question: Is Mr Danby's refusal to attack these columnists' toleration of clearly racist, violent, xenophobic and fascistic remarks somehow related to their being solid supporters of the most far-Right views inside Israel? Would Mr Danby be more vocal in his criticism of these bloggers if they were somewhat less supportive of Israel?